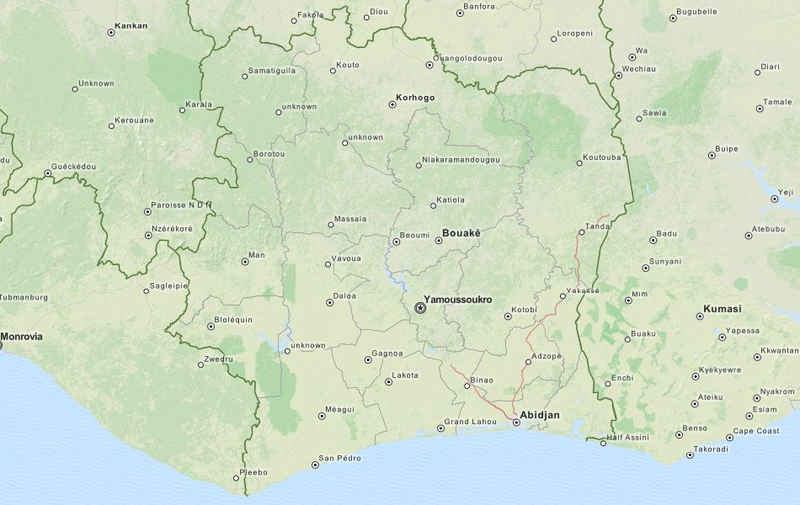 ExpertGPS downloads waypoints and tracks from your GPS, and displays them over high-resolution, seamless maps of Cote d'Ivoire. Draw right on the map to plan your next adventure, or import data from AutoCAD, ArcGIS, or Excel. Use ExpertGPS to upload data from your GPS, convert Ivorian coordinates, calculate area, and create professional maps that you can print out or include in reports. To download unlimited maps of Cote d'Ivoire, download and install ExpertGPS. Click Go to Country... on the Go menu. Select Cote d'Ivoire from the list, and ExpertGPS will display a map of Yamoussoukro. As you scroll around the map and zoom in and out, ExpertGPS will automatically download maps of the area you are viewing. You can use the Go to Address command to get maps for any Ivorian address. Connect any Garmin, Lowrance, or Magellan GPS receiver, and click Receive from GPS to see all of your GPS data on the map. ExpertGPS lets you quickly edit the names of your GPS waypoints, clean up your GPS tracklogs, and save your GPS data to your computer for safe-keeping. ExpertGPS can calculate distances and areas, plot the elevation profile of your hikes, and export your GPS data to Excel, other programs that use GPX files, and to ArcGIS and AutoCAD. ExpertGPS can also convert Ivorian coordinates and datums, geocode Ivorian addresses, calculate areas and acreage, and act as a batch converter for all of your GIS, CAD, and GPS data.